Turtles can be rather unpredictable in their potty times, which means it may be difficult to know when to coach her to go to the bathroom. Pay careful attention to her cues, and talk with your Turtle about them. In order to know when to go to the bathroom, your child needs to begin to understand and become comfortable with what’s happening inside her body. Get to know your child’s favorites. 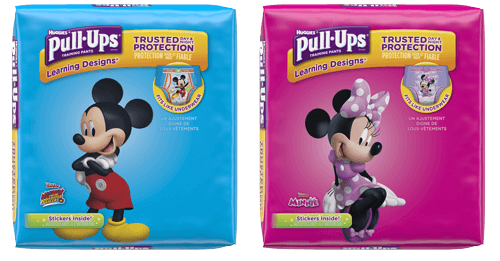 Which Disney character (on Pull-Ups products) does your Turtle relate to best? Use this character as a guide, and have fun with it! Work the Disney character into a story you are telling that will help your Turtle feel comfortable with the changes associated with potty training. Even if your Turtle notices his Learning Designs have changed, or that his Cool & Learn feels “funny” to him, he may still be hesitant to initiate a trip to the bathroom for a change. If you suspect he needs some help, get out a toy and role play what is happening. You can even use the same character as is on the Pull-Ups, if you want.“(Character name) is feeling like he needs to go to the bathroom. His tummy is getting tight and full. He’s feeling like he needs to dance around. What do you think he should do?” Ask open-ended questions about what the character is feeling, and notice how the character can help your Turtle share when they are feeling embarrassed or uncomfortable talking about themselves. Turtles tend to get nervous about the process, which can cause them to have a hard time releasing the muscles they need to relax in order to “let it all come out.” Don’t be afraid to get silly, and redirect attention to a toy, book or story to help your Turtle to relax. Turtles tend to get nervous about the process, which can cause them to have a hard time releasing the muscles they need to relax in order to “let it all come out.” Don’t be afraid to get silly, and redirect attention to the toy to help your Turtle to relax so his body can do what it needs to do. Looking at books about using the potty can also help your Turtle become more comfortable with the idea (and relaxed enough to let nature take its course), so put a basket of books in the bathroom. Create a routine that’s fun for the two of you. Maybe you always do the “potty train conga line” on your way to the bathroom, for example. Once your Turtle becomes comfortable with the toilet and her bodily functions, create easy goals and collaboratively develop predictable routines for the process. One way to do that is to use the Time to Potty app.The app helps remind you and your Turtle every 30 minutes (or another time of your choosing) that it’s time to try to use the potty. If your Turtle resists using the Time to Potty app at any point, back off and take a break. “Okay, do you want to put your Pull-Ups back on, or should I? And you let me know when you want to start up Time to Potty again.” Feel free to try again after a short break, and see how Turtle responds. In general with Turtles, you want to positively reinforce habits, but be careful: Your Turtle will back off if they get too much praise, as it makes them feel self-conscious. Give short, specific feedback about what’s working. Sometimes your Turtle may be frustrated because nothing is coming out. You want to keep the experience positive, so take a break. You can always come back and try again soon. Short, enjoyable trips to the potty will breed much more success than long, miserable visits. Listen to your Turtle’s cues and resist the temptation to push him too quickly toward potty training.